World Heroes 2 © 1993 ADK. 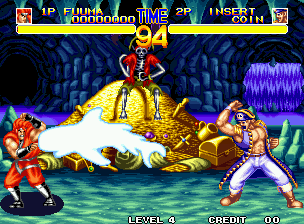 14 characters and 2 end bosses do battle in normal or death match modes. World Heroes 2 was released in April 1993. Captain Kidd is based on the real Captain William Kidd (1645-1701). Erick is loosely based on Erik the Red. Mudman is similar to protagonist of Daijiro Morohoshi's "Mud Men" series in Monthly Sh?nen Champion Z?kan. Ryoko is based on famous real-life judoka Ryoko Tani (formerly Ryoko Tamura). Fighter's History, released in the same year as this game, featured a character with the same basis and name (on a related note). Shura is based on the legendary Muay Thai hero Nai Khanom Tom. The last boss of this game was inspired by the character 'Baoh' from the manga of the same name. The difficulty setting seems to have no effect on the game, the game is just as difficult on Level 1 as it is on Level 8! * Alternate Costume Colors : Press B button when selecting a character. * Most characters have a preset multi-hit combo that can be used by simply tapping the punch button many times while next to an enemy! * Some characters that have hold-type throws (Kim Dragon, Ryoko, Muscle Power, Rasputin & J. Maximum) can drain LOTS of energy of a CPU controlled fighter by quickly shaking the joystick left or right while performing a hold! Oddly enough, this trick does not seem to work with some character's holds such as Janne, Captain Kidd & Mudman though! [JP] SNK Neo-Geo AES (june.4, 1993) "World Heroes 2 [Model ALH-006]"
[US] SNK Neo-Geo AES (june.4, 1993) "World Heroes 2 [Model NGH-057]"
NEC PC-Engine Super CD-ROM [JP] (june.4, 1994) "World Heroes 2 [Model HCD4063]"
[JP] Nintendo Super Famicom (jul.1, 1994) "World Heroes 2 [Model SHVC-JI]"
[JP] SNK Neo-Geo CD (apr.14, 1995) "World Heroes 2 [Model ADCD-006]"